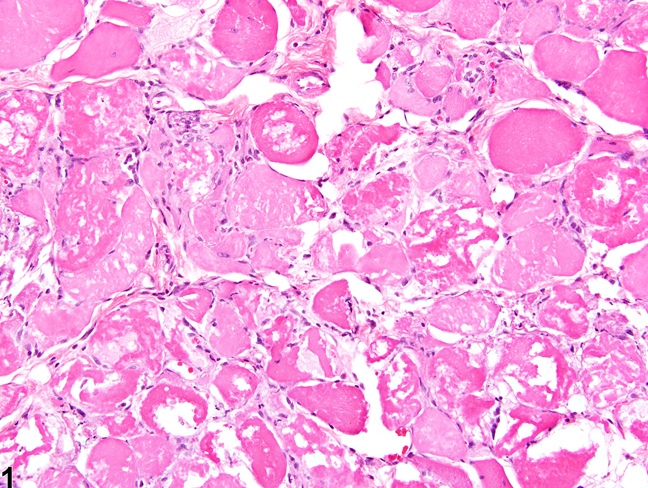 Skeletal muscle - Necrosis in a male F344/N rat from a chronic study. This cross section of skeletal muscle exhibits an extensive, highly fragmented and vacuolated collection of muscle fibers; some are hypereosinophilic, and others are pale. 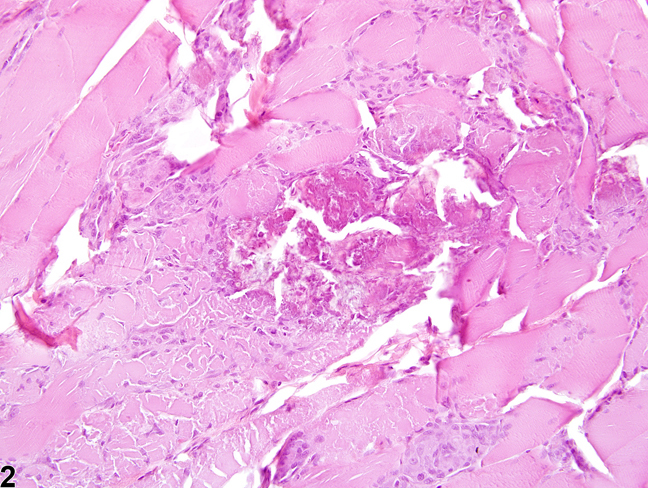 Skeletal muscle - Necrosis in a male F344/N rat from a chronic study. Dystrophic mineralization has affected several necrotic muscle fibers. 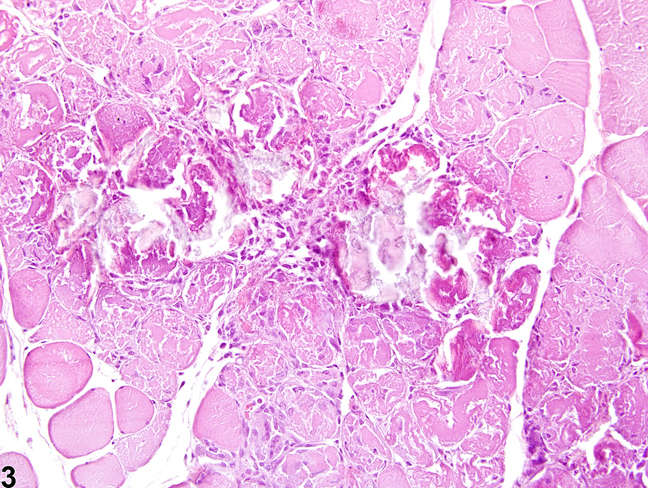 Skeletal muscle - Necrosis in a male F344/N rat from a chronic study. Two areas of necrosis have become mineralized. Numerous types of injury, including trauma, ischemia, infectious agents, and myotoxins, can cause myofiber necrosis. Myofiber necrosis (myonecrosis) is histologically characterized by swollen, deeply eosinophilic, homogeneous myofibers that lack cross striations (hyalinization). Affected fibers are often vacuolated and fragmented with pyknotic nuclei ( Figure 1 ). Concurrent inflammation is common. Dystrophic mineralization ( Figure 2 and Figure 3 ) can also occur. Various stages of myofiber degeneration and regeneration are also often present (see Skeletal Muscle - Degeneration and Skeletal Muscle - Regeneration). Degeneration and necrosis represent a continuum of lesions and therefore are often both present within a given lesion. 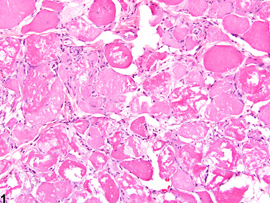 Due to the limited repertoire of skeletal muscle responses, they share similar morphologic features and can thus be difficult to differentiate histologically. This can create a diagnostic challenge. When evaluating a toxicity study, it is important for the pathologist to establish distinct criteria for both lesions and to be consistent and careful when applying them. Criteria should be described in the narrative. The term "myopathy" has commonly been used to describe disorders of skeletal muscle in which degeneration and necrosis are key features. 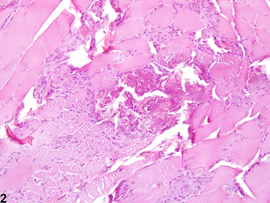 However, since myopathy is a general term and one that typically encompasses a collection of lesions rather than one distinct lesion, its use is not recommended. When necrosis is considered the primary lesion, such as with infarction, the lesion should be diagnosed and assigned a severity grade. If both degeneration and necrosis are present in a study, the predominant lesion should be diagnosed and the other described in the pathology narrative. However, the pathologist may record both lesions if it best describes the changes that are occurring. Concomitant regeneration should generally not be recorded separately unless present to a significant extent but should be described in the narrative. Other secondary lesions, such as inflammation and hemorrhage, should not be diagnosed separately unless warranted by severity but should be described in the narrative. Manor D, Sadeh M. 1989. Muscle fibre necrosis induced by intramuscular injection of drugs. Br J Exp Pathol 70:457-462. Weller AH, Magliato SA, Bell KP, Rodenberg NL. 1997. Spontaneous myopathy in the SJL/J mouse: Pathology and strength loss. Muscle Nerve 20:72-82.